When I was a young lad and fell in true love for the first time, I used to sneak out of my house at night. I'd ride my bike a few miles to my girlfriend's house and sneak in through her window. We would cuddle, kiss and whisper like teenagers do. One time we both fell asleep and when we woke up, it was morning. In a panic, I backed out of her window and just as I was shutting the window, I heard her door click as her father opened her bedroom door. Talk about close! What the heck does that have to do with chicken? I recently received a copy of The Salt Lick Cookbook to review and this recipe had a charming story about how Scott Roberts fancied a worker at his dad's restaurant. He would sneak across a creek in the dark to visit her on her grandparents' ranch. One night, as I was quietly making my exit, the family house front porch light came on and the door slammed open. It was a full moon and I could see a big man (her grandfather) swinging a huge 12 gauge shotgun in the air. He was wearing only an undershirt and boxer shorts, but he had managed to throw on his cowboy boots and a big cowboy hat. I never had shotgun pellets flying overhead as I ran from my girlfriend's home but this story resonated with me and brought back those memories. That's the great thing about this book from a legendary Texas BBQ, it is full of stories and recipes that will stir memories and taste buds. Here is my take on the recipe that followed that story. Mix all of the compound butter ingredients together in a bowl. Use a piece of wax paper to form it into a roll or log. Cut into 4 sections. Preheat your oven or a grill set up for indirect heat to 400f. Season the top and bottom of the chicken breasts with salt and pepper. Use two sections of the butter and press it up under the skin of the 4 chicken breasts. Slather the third section of the butter on top of the skin. 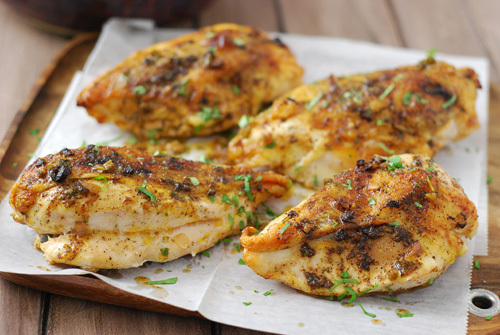 Place the chicken breasts on a raised rack above a sheet pan with edges and place in the middle rack of the oven. Cook until the internal temp reaches 160, about 45 minutes. Remove from the grill/oven. Heat up the last section of butter and drizzle over the chicken. The roots of Salt Lick Bar-B-Que started in 1867 and landed in Driftwood, Texas. As you can imagine, it has a storied history and the new cookbook is chock full of their tales and recipes. For me, a great cookbook has recipes, stories, photos, and tutorials and this book nails it in all four categories. It is not just a collection of recipes. It is an immersion into the food, family, and culture of the Hill Country of Texas. Roberts shares the wonderful stories behind the recipes, much like the one for the Lover's Chicken Breast. 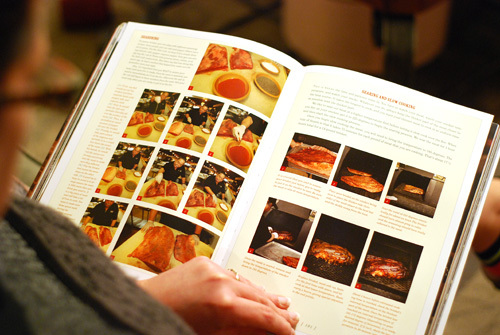 While this is a cookbook from the famed BBQ restaurant, this isn't just a BBQ cookbook. 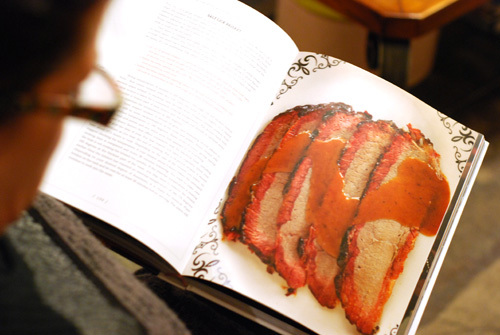 Only about a quarter of the book is dedicated to BBQ. The rest are family recipes from owner Scott Roberts' family. I would say it is more about homestyle cooking. This is a cookbook that any home chef can use and will appreciate, not just barbecuers. Be forewarned, if you are buying the book to get your hands on the recipe for the restaurant's secret BBQ sauce, you will be disappointed. Instead it says to use a jar of your favorite sauce and rub (or you can order theirs) and focuses on giving you the cooking techniques they use. I like that they don't skimp on color pictures. In many cases they provide multi-photo step by step guides, which is a nice touch. You can tell that Roberts took great pains to make sure that this book is quality from cover to cover. It is a hard back with glossy pages, something more and more rare these days. The food styling in the photos is intricate. The photos have purpose. All in all, I'm impressed with the work that Roberts, Jessica Dupuy, and their team have put together. 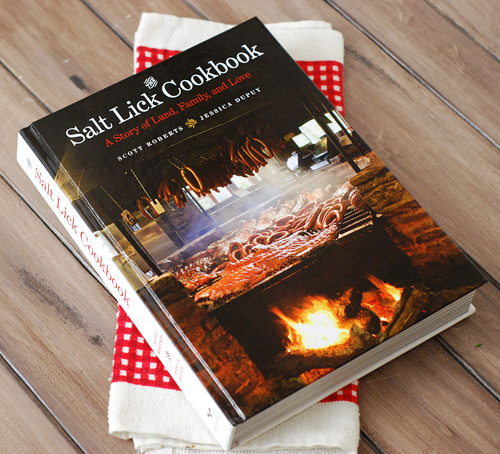 The Salt Lick Cookbook: A Story of Land, Family, and Love would make an excellent gift for someone. Maybe even a "gift" for yourself! [Standard Disclaimer] I received a free review copy of this book from the publisher; however, the contents of the review are my own opinions.